When Tony Hawk's Pro Skater burst onto the gaming scene in 1999, it was met with universal acclaim. On top of that, it also helped the extreme sport of skateboarding reach a marketing zenith and Tony Hawk soon became a household name. Of course, with all sports games, a new iteration and competition came year after year, and on top of that, the "birdman" started getting old, and his gaming franchise aged with him. Now to kickoff Xbox Live's "Summer of Arcade," the Hawk is back in Tony Hawk's Pro Skater HD, a high-definition reiteration of the best of both Tony Hawk's Pro Skater and Tony Hawk's Pro Skater 2. While the game suffers from rough edges, namely with its control scheme and lack of content compared to the games we see now, it's still a nostalgic and entertaining look at what helped put Activision on the map before they became known for games like Modern Warfare. People can say the Tony Hawk games were all about skating and doing tricks, but it's really all about what made extreme sports cool in the first place. 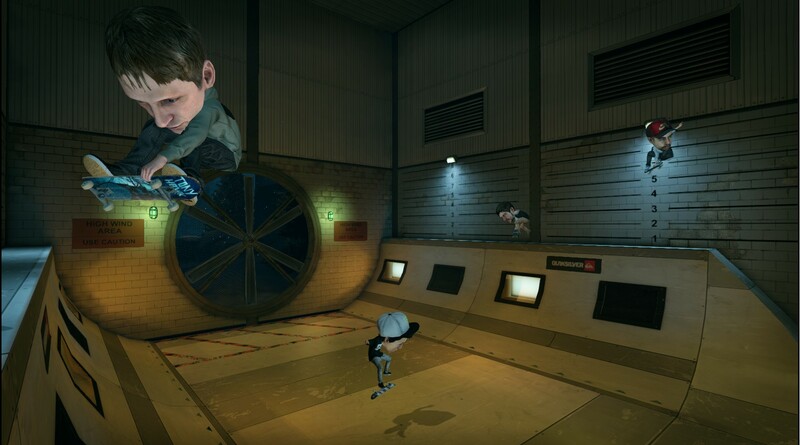 Like the rest of the series, Tony Hawk's Pro Skater HD is all about doing impossible things with a skateboard. Riding down slopes and falling down without losing your skateboard? Crashing through walkways hanging off of rafters in the attempt of finding a secret VHS tape (now a secret DVD)? Grinding on and off every propeller on a helicopter in the hopes of finding $200? All of this is what makes the essence of Tony Hawk's Pro Skater. 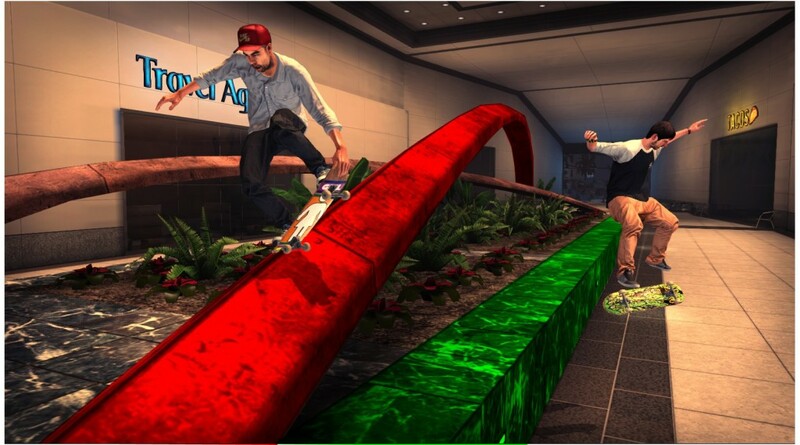 The game, for right now, features 16 riders (including your own Xbox Avatar and Tony Hawk's son, Riley) that are available for use through the game's career mode, where the cash you earn for achieving each map's goals leads to enhancing each rider's stats as well as the opportunity to unlock other levels from the first two Tony Hawk games, making this quite a trip down memory lane. It's no secret that not all gamers are into skateboarding. Heck, the gamer-to-skater ratio can't possibly be that high. Nonetheless, one of the reasons why THPS is looked at as a great, long-running series because it's extremely fun to play, and it's addictive. People who haven't played the first few games in the series, or haven't even tried the Hawk series in general, definitely owe it to themselves to do so. The original gameplay mechanics and a version of the original physics of developer Neversoft's classic games are still intact, thanks to developer Robomodo, to give the game its authentic and nostalgic feel. Veterans have to keep in mind, though, that it's kind of hard to regain the muscle memory from these games if they're too used to the newer Hawk titles due to the fact that THPS really didn't make use of all the buttons the series does now. It also might be a preference to use the Xbox's directional buttons rather than the analog stick because it's simply more accurate. For those who need to be refreshed with how the game controls, it's all based on third-yet-first-person perspective. To properly land a spinning trick, the top of the board has to stay vertical from the ground. Landing horizontally will lead to an extremely harmful and bloody bail, and while you won't lose points, you definitely lose the opportunity for big points that'll fill your gauge–not to mention bailing leads to complete depletion of your special gauge. When your rider's gauge is filled, it gives you the opportunity to pull off their signature moves for massive point totals. Unfortunately, both THPS and THPS2 favored vert riders (skaters that specialize with halfpipe tricks), so most of the tricks are only possible when catching big air off a halfpipe ollie. Thankfully, this can easily be taken advantage of with the Manual, a trick introduced in THPS2, to help make bigger combos and multpliers. However, the "Revert," introduced in Tony Hawk's Pro Skater 3, doesn't make an appearance due to the fact that the game is more of a tribute to the first two games, but the folks at Robomodo said that the revert will be an added ability when they include maps from THPS3 as DLC to shred on. While it's unfortunate that this iteration won't include those features just yet, perhaps the most alarming thing with the game is that it doesn't include a bunch of skaters found in the originals. While the game does bring back streetskaters like Rodney Mullen, Eric Koston, and Andrew Reynolds, other popular favorites like Bucky Lasek, Chad Muska, or even Bob Burnquist didn't make the cut. It's probably due to retirement royalties or the difficulty of gathering namesakes, but it's tough to fully embellish nostalgia when everything you remembered isn't there–especially Burnquist, who was in every THPS game with the exception of THPS3 due to him being in an X-Games video game. Another unfortunate feature is its multiplayer. 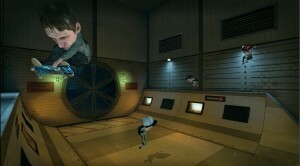 It's nice that the game is online, and that new modes such as Big Head Survival (a game where you have to trick as much as possible to keep your head from growing so much, it explodes and you presumably die) keeps it interesting, but the process of starting a game is extremely troublesome. Hosts have to make every setting, including the lobby of players. So after every level or heat, players are kicked out and have to wait to be re-invited again before beginning the next one. While the lobby system is a mess, the actual online gameplay from what we've experienced is virtually free of lag. Then again, these are Xbox Live servers, and the game isn't a week old yet upon review, so that's to be expected. But even with the fun you can have online, there is no offline multiplayer and you can't build your own skatepark, and that's a virtual kick to the nuts for people who want to invite friends over to play the game like they would in the good old days. Despite its rather big shortcomings, Tony Hawk's Pro Skater HD is Tony Hawk's Pro Skater, the way it used to be. It may not be the best remake of the first two games (that distinction belongs to Tony Hawk's Pro Skater 2X, but where will you find a fresh copy? ), but it offers as close to an authentic HD experience as you can get today. With great graphics, a killer soundtrack featuring both old and new music, and a promising DLC, Tony Hawk's Pro Skater HD is every bit as good as the originals–provided you give it all the time that Tony Hawk himself did in making sure Activision got this game made.